For some, summer means taking a trip to the beach or lounging around by the pool. However, you might not realize that there’s an experience waiting to be had right here in your own backyard. 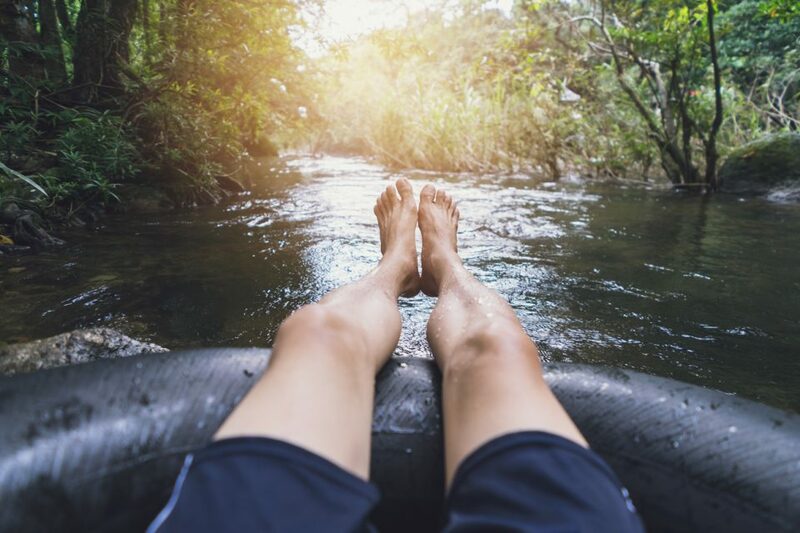 If you’re looking for a way to get the kids outside, as well as have fun for yourself, we recommend getting up close with nature by tubing down the Little Cahaba River in Birmingham, Alabama. Located southwest of Birmingham at 151 Limestone Pkwy, Brierfield, AL is a fun adventure that you and your friends will love. This 6.7-mile run of water has lots of twists and turns. With a few ledge drops of 3 feet or less, the ride provides enough excitement to keep adventure-seekers happy. Don’t worry – those who just want to lay back and enjoy the ride will still enjoy the peaceful environment and scenic route that floating down the river provides. In addition to this, those who decide to tube down the Little Cahaba River will also be treated with a swimming hole midway through the route. At the McGuire’s Ford swimming hole, you and your friends can take a dip and cool off with a bit of swimming. To protect your skin from scraping against rough rocks and the bottom of shallow areas in the river, it’s best for participants to wear thick shorts such as denim cutoffs. As for footwear, closed-toe shoes are highly recommended. By wearing closed-toe shoes, you can better protect your feet and toes from getting scratched up from the rocks. We all know Alabama weather can be predictable. However, one thing is for sure: there will be humidity and extremely warm weather during the summer. Because of this, participants are advised to wear loose-fitting shirts, as well as clothing that dries easily. For those wanting to bring a cooler with food and drinks, it’s best to purchase a cooler tube to help you have space during your journey down the river. Due to the drops and sometimes fast-paced movement of the river, visitors are advised to strap down coolers so they won’t flip over and lose the contents. Tubes are $10 and cooler tubes are $5. Before you take a journey down the river, stop by Limbaugh Toyota to find the perfect ride for your journey on the road. At our dealership, we gladly offer a large selection of new and pre-owned vehicles. Our inventory is diverse, so we’re certain you’ll find something you love. On top of our vast inventory, we also have several specials and deals that drivers can take advantage of. What are you waiting for? Come see us! We are conveniently located at 2200 Avenue T, Birmingham, AL 35218.